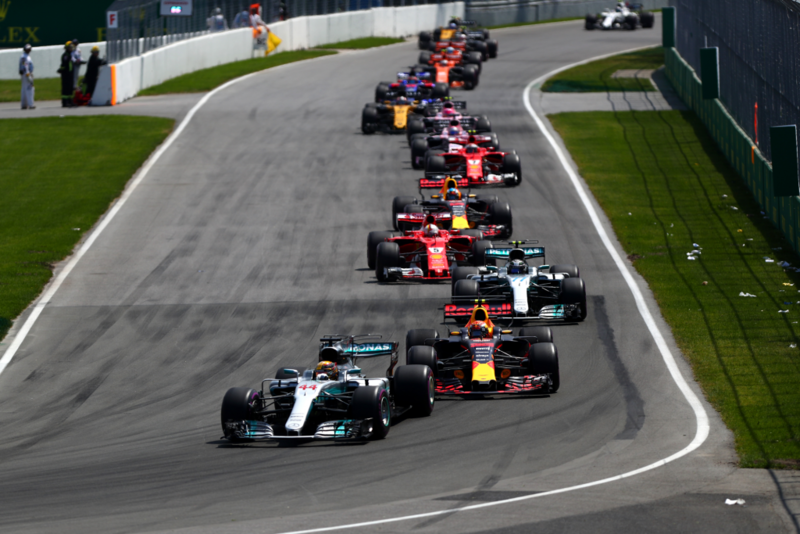 Canadian GP F1 Strategy Report Podcast – our host Michael Lamonato is joined by Ernie Black – the F1 Poet. 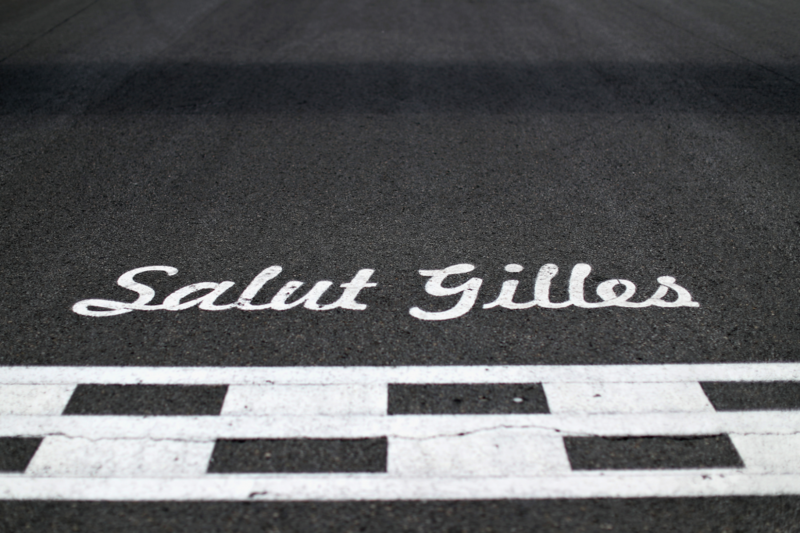 The Circuit Gilles Villeneuve is known for producing exciting Formula 1 races and it didn’t disappoint in 2017, with a fun and frantic Canadian Grand Prix packed full of fascinating moments. Despite high temperatures and the challenging nature of the track, a smooth track surface makes for relatively low tyre degradation – meaning it wasn’t the most exciting strategic race we’ve seen. That was despite the three softest tyre compounds being taken to the race. But, while it wasn’t the most open race in terms of strategy, there were still plenty of headlines and stories to take a look at. Simply put, Mercedes and Lewis Hamilton were in a league of their own on race day. While Ferrari looked in the mix on Friday and close on Saturday, Mercedes worked hard to get on top of their tyre woes – especially with the ultra-softs – and this showed during the Canadian GP. Also, with Hamilton out front, he was in clean air and able to manage his own race. So, he put in a relatively straight-forward one-stop race, pitting for the only time on lap 32. A radio message appeared to indicate Mercedes would go to the safer soft tyre to get to the end, but encouraging pace and degradation on the super-soft probably changed their mind. In the end, Valtteri Bottas didn’t have the pace to challenge Hamilton, and he finished 19 seconds behind first place. But, the Finn could’ve had an easier race had he not come out behind Esteban Ocon at his only pitstop. This was slightly earlier than planned, because Mercedes said he suffered a flat-spot and needed to get it changed. He needed to find three seconds to emerge ahead of Ocon and could’ve done that had he stayed out without the flat-spot, but the earlier trip to the pits meant that wasn’t possible. He lost around two seconds behind Ocon before the Force India pitted on lap 32, which cost him some ground. Bottas would still have finished well behind Hamilton but he would’ve had an easier run, after a poor start and getting stuck behind a slower car. Sebastian Vettel’s chances of a podium finish vanished on lap one when he was tagged by Max Verstappen’s Red Bull at the first corner, which damaged his front wing. Ferrari still looked very strong in race trim but that knock in downforce clearly impacted Vettel’s early speed. It was puzzling as to why Ferrari didn’t pit Vettel to change the front wing behind the safety car, was while he would’ve been at the back of the train, he would’ve had more time with quick tyres and a proper front wing to bounce back and make up ground in a quicker fashion – even though a two-stop would still have been the way to go. Instead, Vettel was stopped under green flag conditions on lap five, before a long super-soft stint. The team opted to go for a second stop late on, fitting ultra-softs for a late challenge that almost didn’t pay off, but did in the end – as he jumped ahead of the Force Indias. He was 29 seconds off the lead after his first stop and finished 35 seconds behind Hamilton, so the pace was clearly there. Ferrari decided to pit Kimi Raikkonen early in order to undercut Sergio Perez, who had passed him after a wild moment at Turn 8. But, the Finnish driver wasn’t really close enough before the stop to properly make use of it. When it became clear Ferrari needed to go for another plan if they wanted to pass the Force Indias, they pitted Raikkonen for ultra-softs, but a brake issue halted his charge. Daniel Ricciardo was pitted on lap 18 to cover off Raikkonen, but he was further up the road so there wasn’t really any need for it. He was put on softs, the most durable tyre – a risk in some respects, with its lower grip levels and performance, but they knew it’d get to the end. It meant Ricciardo had to defend hard but his tyres were still in good shape by the end. But, he did question afterwards if the super-softs would’ve been better, as they lasted a large number of laps and many drivers reached the end on them. Perhaps that would’ve made his life easier, in hindsight. When Raikkonen and Ricciardo pitted, Perez found himself in clear air but didn’t make the most of it. His pace wasn’t strong enough to properly take advantage of an overcut and Force India pitted him the next lap anyway, going onto super-softs. This was the better option as he was able to attack Ricciardo on the higher grip compound, but he did start to struggle by the end of the race. One of the major storylines to emerge from the Canadian GP was the inter-team battle at Force India, with Perez refusing to let Ocon through and challenge Ricciardo, which eventually cost them both a spot to Vettel. On lap 49, the Ferrari’s were 13 seconds behind but on much fresher tyres. Ricciardo did struggle a bit on the soft tyre and with its lower grip levels. 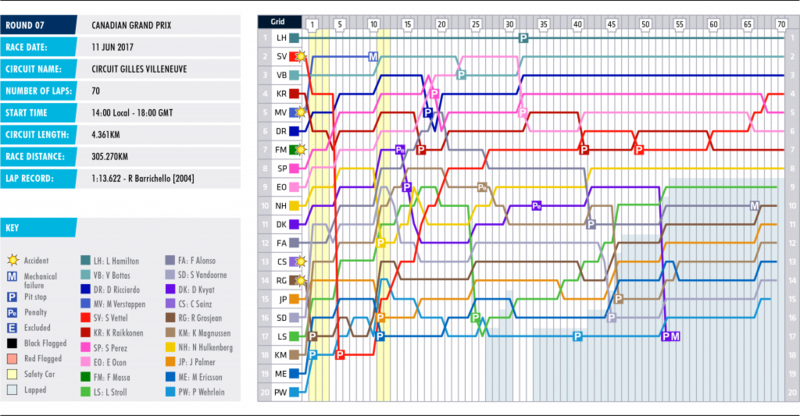 But, Ocon did appear to have better pace and Perez also had his issues on the super-soft, especially towards the end. So, it seemed logical to let Ocon have a go, at least for a few laps, as he seemed to have superior pace. Perez wasn’t having it though and even negotiated with the team over the radio. There didn’t seem to be a clear voice or a firm stance on it, and in the end Perez and Ocon scrapping let Ricciardo escape a little and helped Vettel close in faster. Fernando Alonso narrowly lost out on a point, as he was running 10th when his engine failed with two laps to go. Unsurprising, the engine failure may have been, but his pace up to that point was pretty encouraging and he’d run as high as fourth due to a very, very long ultra-soft stint. Lance Stroll’s come under fire during his rookie campaign so far for some erratic moments and underwhelming drives, but he fought back with a charging drive on home soil in Canada. He picked off a few cars on ultra-softs before pitting for super-softs on lap 25, where his pace transformed and he was able to make up even more ground to finish ninth. 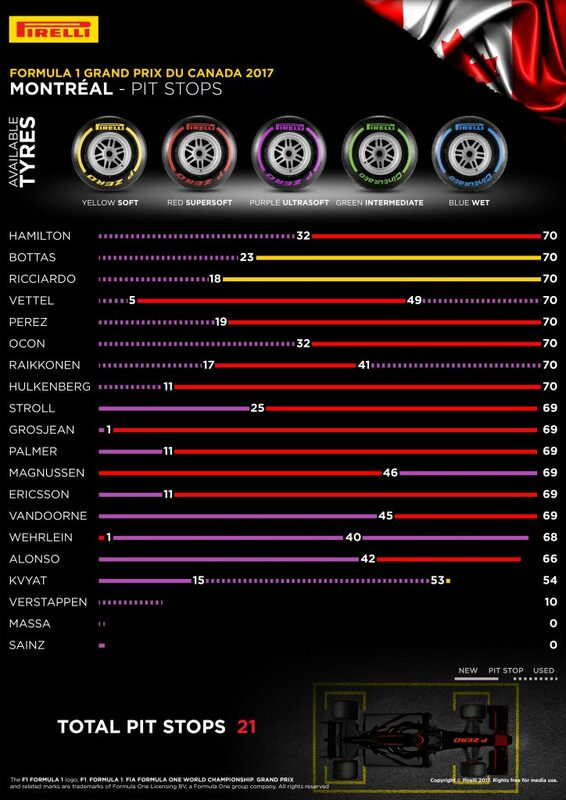 As predicted by Pirelli, low tyre degradation meant a one-stop was the favoured and safer strategy, although a two-stop was used by a few and was the more aggressive choice. It’s not often in 2017 we see all three compounds being used in a race, but we did in Canada as the difference between them was less. 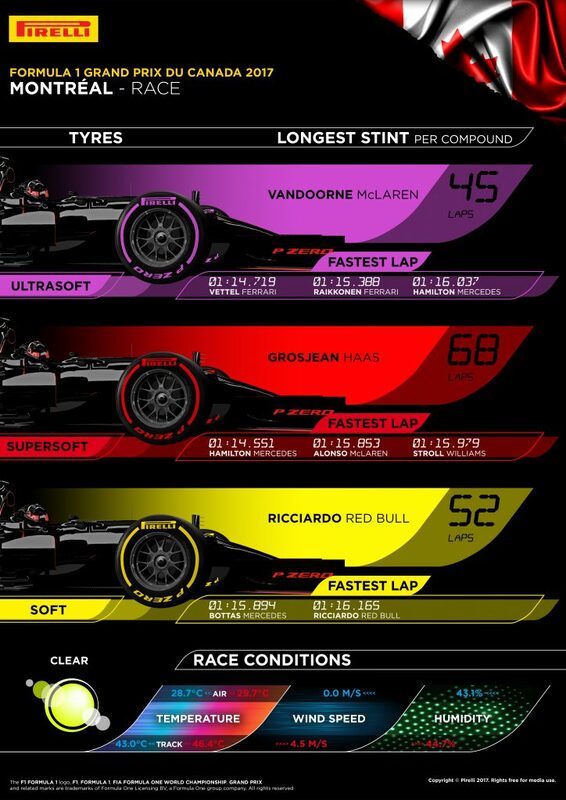 The tyres held up well all weekend, with 45 laps the longest ultra-soft stint (Vandoorne), 68 on the super-soft (Romain Grosjean) and 52 on softs (Ricciardo).